Although type 2 diabetes is widely diagnosed in adults, its frequency has markedly increased in the pediatric age group since the end of the 20th century. Most pediatric patients with type 2 diabetes belong to minority communities. A simplified scheme for the etiology of type 2 diabetes mellitus is shown in the image below. In individuals without diabetes, approximately 50% of their total daily insulin is secreted during basal periods to suppress lipolysis, proteolysis, and glycogenolysis. In response to a meal, rapid insulin secretion (also called first-phase insulin secretion) ensues. This secretion facilitates the peripheral use of the prandial nutrient load, suppresses hepatic glucose production, and limits postprandial elevations in glucose levels. The second phase of insulin secretion follows and is sustained until normoglycemia is restored. A simplified scheme for the etiology of type 2 diabetes mellitus is shown in the image below. 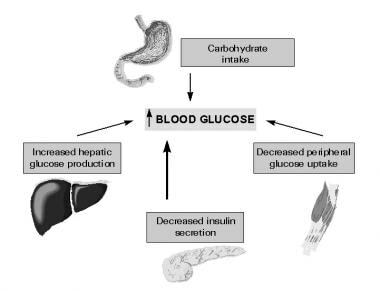 In parallel, as a result of decreased insulin sensitivity in the liver, endogenous glucose output increase adds to the already hyperglycemic milieu, worsening peripheral insulin resistance and beta cell function. Failure of the beta cell to keep up with the peripheral insulin resistance is the basis for the progression from impaired glucose tolerance to overt clinical type 2 diabetes. Longitudinal studies have demonstrated that during the transition between normal glucose tolerance to diabetes, 31% of a person's insulin-mediated glucose disposal capacity, as well as 78% of his or her acute insulin response, is lost. The UK Prospective Diabetes Study found that beta cell function was 50% of normal at the time of diagnosis of type 2 diabetes in adults. A case study of the progression of diabetes in an adolescent female found an almost 15% decline in beta cell function per year over the 6-year duration of diabetes, with no substantial changes in insulin sensitivity. Further prospective studies in young persons with type 2 diabetes are needed in order to clarify the mechanism of disease in this population. In a retrospective cohort study of more than 43,000 individuals, study participants who were prescribed antipsychotics were significantly more likely to develop type 2 diabetes within the first year of use compared with matched controls who were not prescribed these medications. The risk increased with higher medication doses and remained elevated for up to 1 year after the medications were discontinued. The association between antipsychotic use and type 2 diabetes remained highly significant when only participants younger than 18 years were assessed. The study included 28,858 first-time users of antipsychotic medications and 14,429 matched control individuals who had recently initiated use of a psychotropic other than an antipsychotic, all from the Tennessee Medicaid program. All participants were 6 to 24 years of age. Antipsychotics used included risperidone, quetiapine, aripiprazole, and olanzapine. Medications used by the control group included mood stabilizers such as lithium, as well as antidepressants, psychostimulants, α-agonists, and benzodiazepines. Although type 2 diabetes is widely diagnosed in adults, its frequency has markedly increased in the pediatric age group since the end of the 20th century. Depending on the population studied, type 2 diabetes now represents 8-45% of all new cases of diabetes reported among children and adolescents. Most pediatric patients with type 2 diabetes belong to minority communities. Type 2 diabetes primarily affects minority populations. From 1967-1976 to 1987-1996, the prevalence of type 2 diabetes increased 6-fold in Pima Indian adolescents and appeared for the first time in children and adolescents younger than age 15 years. Similar increases in prevalence were observed among Japanese, Asian-American, and black children. In several clinics across the United States, pediatric patients with a diagnosis of type 2 diabetes were from minority ethnic groups (black, Asian, and Hispanic groups). According to data from the SEARCH for Diabetes in Youth study, the overall prevalence of type 2 diabetes among American youths aged 10-19 years rose by 35% between 2001 and 2009 (from 0.34 per 1000 to 0.46 per 1000). Study data were obtained from 38 counties in five states, as well as American Indian reservations in Arizona and New Mexico, and included young people from several different racial-ethnic backgrounds. The greatest increase in the prevalence of type 2 diabetes from 2001 to 2009 was observed in Hispanic youths (from 0.45 per 1000 to 0.79 per 1000), followed by blacks (from 0.95 per 1000 to 1.06 per 1000), and whites (from 0.14 per 1000 to 0.17 per 1000). There were no significant changes in prevalence for either American Indians or Asian Pacific Islanders. After 30 years of postpubertal diabetes, 44.4% of people with type 2 diabetes and 20.2% of people with type 1 diabetes develop diabetic nephropathy. Overall, the incidence of nephropathy has declined among patients with type 1 diabetes since the end of the 20th century; however, it has not for persons with type 2 diabetes. So far, no population-based follow-up study has been conducted to determine the long-term prognosis of type 2 diabetes among children and adolescents. Mortality rates and standardized mortality ratios in type 2 diabetes are likely higher than those in type 1 diabetes, given that the major cause of death in type 1 diabetes is end-stage renal disease. Educate the patient about the potential side effects of oral hypoglycemic agents (eg, the presence of ketonuria or of any condition predisposing to the accumulation of lactate in patients on metformin). With regard to the patient’s sexual health, provide advice about contraception, genital hygiene, sexually transmitted diseases, and fungal infections. In pregnant patients with type 2 diabetes, emphasize the importance of good glycemic control before and during pregnancy and discuss the effect of maternal diabetes on the fetus. [Guideline] Diagnosis and classification of diabetes mellitus. Diabetes Care. 2004 Jan. 27 Suppl 1:S5-S10. [Medline]. American Diabetes Association. Type 2 diabetes in children and adolescents. Diabetes Care. 2000 Mar. 23(3):381-9. [Medline]. Management of dyslipidemia in children and adolescents with diabetes. Diabetes Care. 2003 Jul. 26(7):2194-7. [Medline]. Bennett WL, Maruthur NM, Singh S, et al. Comparative effectiveness and safety of medications for type 2 diabetes: an update including new drugs and 2-drug combinations. Ann Intern Med. 2011 May 3. 154(9):602-13. [Medline]. Alberti G, Zimmet P, Shaw J, Bloomgarden Z, Kaufman F, Silink M. Type 2 diabetes in the young: the evolving epidemic: the international diabetes federation consensus workshop. Diabetes Care. 2004 Jul. 27(7):1798-811. [Medline]. Morales AE, Rosenbloom AL. Death caused by hyperglycemic hyperosmolar state at the onset of type 2 diabetes. J Pediatr. 2004 Feb. 144(2):270-3. [Medline]. Ten S, Maclaren N. Insulin resistance syndrome in children. J Clin Endocrinol Metab. 2004 Jun. 89(6):2526-39. [Medline]. Hillier TA, Pedula KL. Complications in young adults with early-onset type 2 diabetes: losing the relative protection of youth. Diabetes Care. 2003 Nov. 26(11):2999-3005. [Medline]. Weyer C, Bogardus C, Mott DM, Pratley RE. The natural history of insulin secretory dysfunction and insulin resistance in the pathogenesis of type 2 diabetes mellitus. J Clin Invest. 1999 Sep. 104(6):787-94. [Medline]. Matthews DR, Cull CA, Stratton IM, Holman RR, Turner RC. UKPDS 26: Sulphonylurea failure in non-insulin-dependent diabetic patients over six years. UK Prospective Diabetes Study (UKPDS) Group. Diabet Med. 1998 Apr. 15(4):297-303. [Medline]. Gungor N, Arslanian S. Progressive beta cell failure in type 2 diabetes mellitus of youth. J Pediatr. 2004 May. 144(5):656-9. [Medline]. Rosenbloom AL, Joe JR, Young RS, Winter WE. Emerging epidemic of type 2 diabetes in youth. Diabetes Care. 1999 Feb. 22(2):345-54. [Medline]. Wei JN, Sung FC, Li CY, et al. Low birth weight and high birth weight infants are both at an increased risk to have type 2 diabetes among schoolchildren in taiwan. Diabetes Care. 2003 Feb. 26(2):343-8. [Medline]. Silverman BL, Metzger BE, Cho NH, Loeb CA. Impaired glucose tolerance in adolescent offspring of diabetic mothers. Relationship to fetal hyperinsulinism. Diabetes Care. May 1995. 18(5):611-7. [Medline]. Young TK, Martens PJ, Taback SP, et al. Type 2 diabetes mellitus in children: prenatal and early infancy risk factors among native canadians. Arch Pediatr Adolesc Med. 2002 Jul. 156(7):651-5. [Medline]. Mayer-Davis EJ, Dabelea D, Lamichhane AP, D'Agostino RB Jr, Liese AD, Thomas J. Breast-feeding and type 2 diabetes in the youth of three ethnic groups: the SEARCh for diabetes in youth case-control study. Diabetes Care. 2008 Mar. 31(3):470-5. [Medline]. Brauser D. More Proof Antipsychotics Boost Kids' Diabetes Risk. Medscape Medical News. Available at http://www.medscape.com/viewarticle/809942. Accessed: August 27, 2013. Bobo WV, Cooper WO, Stein CM, Olfson M, Graham D, Daugherty J, et al. Antipsychotics and the Risk of Type 2 Diabetes Mellitus in Children and Youth. JAMA Psychiatry. 2013 Aug 21. [Medline]. Type 2 diabetes in children and adolescents. American Diabetes Association. Pediatrics. 2000 Mar. 105(3 Pt 1):671-80. [Medline]. Dabelea D, Bell RA, D'Agostino RB Jr, et al. Incidence of diabetes in youth in the United States. JAMA. 2007 Jun 27. 297(24):2716-24. [Medline]. Urakami T, Kubota S, Nitadori Y, Harada K, Owada M, Kitagawa T. Annual incidence and clinical characteristics of type 2 diabetes in children as detected by urine glucose screening in the Tokyo metropolitan area. Diabetes Care. 2005 Aug. 28(8):1876-81. [Medline]. Ehtisham S, Hattersley AT, Dunger DB, Barrett TG,. First UK survey of paediatric type 2 diabetes and MODY. Arch Dis Child. 2004 Jun. 89(6):526-9. [Medline]. Kadiki OA, Reddy MR, Marzouk AA. Incidence of insulin-dependent diabetes (IDDM) and non-insulin-dependent diabetes (NIDDM) (0-34 years at onset) in Benghazi, Libya. Diabetes Res Clin Pract. 1996 May. 32(3):165-73. [Medline]. Chan JC, Cheung CK, Swaminathan R, Nicholls MG, Cockram CS. Obesity, albuminuria and hypertension among Hong Kong Chinese with non-insulin-dependent diabetes mellitus (NIDDM). Postgrad Med J. 1993 Mar. 69(809):204-10. [Medline]. [Full Text]. Ramachandran A, Snehalatha C, Satyavani K, Sivasankari S, Vijay V. Type 2 diabetes in Asian-Indian urban children. Diabetes Care. 2003 Apr. 26(4):1022-5. [Medline]. Sayeed MA, Hussain MZ, Banu A, Rumi MA, Azad Khan AK. Prevalence of diabetes in a suburban population of Bangladesh. Diabetes Res Clin Pract. 1997 Jan. 34(3):149-55. [Medline]. Braun B, Zimmermann MB, Kretchmer N, Spargo RM, Smith RM, Gracey M. Risk factors for diabetes and cardiovascular disease in young Australian aborigines. A 5-year follow-up study. Diabetes Care. 1996 May. 19(5):472-9. [Medline]. McGrath NM, Parker GN, Dawson P. Early presentation of type 2 diabetes mellitus in young New Zealand Maori. Diabetes Res Clin Pract. 1999 Mar. 43(3):205-9. [Medline]. Eppens MC, Craig ME, Jones TW, Silink M, Ong S, Ping YJ. Type 2 diabetes in youth from the Western Pacific region: glycaemic control, diabetes care and complications. Curr Med Res Opin. 2006 May. 22(5):1013-20. [Medline]. Fagot-Campagna A, Pettitt DJ, Engelgau MM, et al. Type 2 diabetes among North American children and adolescents: an epidemiologic review and a public health perspective. J Pediatr. May 2000. 136(5):664-72. [Medline]. Grinstein G, Muzumdar R, Aponte L, et al. Presentation and 5-year follow-up of type 2 diabetes mellitus in African-American and Caribbean-Hispanic adolescents. Horm Res. 2003. 60(3):121-6. [Medline]. Obesity and Type 2 Diabetes as Documented In Private Claims Data. A FAIR Health White Paper. FAIR Health, Inc.; January 2017. 1-16. Phillips D. Diabetes, Obesity-Linked Disorders Double in Kids. Medscape Medical News. Available at http://www.medscape.com/viewarticle/874716#vp_1. January 20, 2017; Accessed: January 31, 2017. Dabelea D, Mayer-Davis EJ, Saydah S, Imperatore G, Linder B, Divers J, et al. Prevalence of type 1 and type 2 diabetes among children and adolescents from 2001 to 2009. JAMA. 2014 May 7. 311(17):1778-86. [Medline]. Yokoyama H, Okudaira M, Otani T, et al. Higher incidence of diabetic nephropathy in type 2 than in type 1 diabetes in early-onset diabetes in Japan. Kidney Int. 2000 Jul. 58(1):302-11. [Medline]. Maahs DM, Snively BM, Bell RA, Dolan L, Hirsch I, Imperatore G. Higher prevalence of elevated albumin excretion in youth with type 2 than type 1 diabetes: the SEARCH for Diabetes in Youth study. Diabetes Care. 2007 Oct. 30(10):2593-8. [Medline]. Dart AB, Sellers EA, Martens PJ, Rigatto C, Brownell MD, Dean HJ. High Burden of Kidney Disease in Youth-Onset Type 2 Diabetes. Diabetes Care. 2012 Mar 19. [Medline]. Krakoff J, Lindsay RS, Looker HC, et al. Incidence of retinopathy and nephropathy in youth-onset compared with adult-onset type 2 diabetes. Diabetes Care. 2003 Jan. 26(1):76-81. [Medline]. Zeitler P, Epstein L, Grey M, Hirst K, KaufmanF, Tamborlane W, et al. Treatment options for type 2 diabetes in adolescents and youth: a study of the comparative efficacy of metformin alone or in combination with rosiglitazone or lifestyle intervention in adolescents with type 2 diabetes. Pediatric Diabetes. 2007. 8(2):74-87. [Medline]. Tryggestad JB, Willi SM. Complications and comorbidities of T2DM in adolescents: findings from the TODAY clinical trial. J Diabetes Complications. 2015 Mar. 29(2):307-12. [Medline]. Solis- Herrera C, Triplitt CL. Nephropathy in Youth and Young Adults with Type 2 Diabetes. Curr Diab Rep. 2014. 14:456-y. [Medline]. Palmert MR, Gordon CM, Kartashov AI, et al. Screening for abnormal glucose tolerance in adolescents with polycystic ovary syndrome. J Clin Endocrinol Metab. 2002 Mar. 87(3):1017-23. [Medline]. Pinhas-Hamiel O, Standiford D, Hamiel D, et al. The type 2 family: a setting for development and treatment of adolescent type 2 diabetes mellitus. Arch Pediatr Adolesc Med. 1999 Oct. 153(10):1063-7. [Medline]. Tucker ME. New guidelines address type 2 diabetes in youth. Medscape Medical News. Jan 28, 2013. Available at http://www.medscape.com/viewarticle/778330. Accessed: Feb 5, 2013. Copeland KC, Silverstein J, Moore KR, Prazar GE, Raymer T, et al. Management of Newly Diagnosed Type 2 Diabetes Mellitus (T2DM) in Children and Adolescents. Pediatrics. 2013 Feb. 131(2):364-82. [Medline]. McGavock J, Sellers E, Dean H. Physical activity for the prevention and management of youth-onset type 2 diabetes mellitus: focus on cardiovascular complications. Diab Vasc Dis Res. 2007 Dec. 4(4):305-10. [Medline]. The fourth report on the diagnosis, evaluation, and treatment of high blood pressure in children and adolescents. Pediatrics. 2004 Aug. 114(2 Suppl 4th Report):555-76. [Medline]. Kooy A, de Jager J, Lehert P, Bets D, Wulffelé MG, Donker AJ, et al. Long-term effects of metformin on metabolism and microvascular and macrovascular disease in patients with type 2 diabetes mellitus. Arch Intern Med. 2009 Mar 23. 169(6):616-25. [Medline]. Home PD, Pocock SJ, Beck-Nielsen H, Gomis R, Hanefeld M, Jones NP, et al. Rosiglitazone evaluated for cardiovascular outcomes--an interim analysis. N Engl J Med. 2007 Jul 5. 357(1):28-38. [Medline]. McAfee AT, Koro C, Landon J, Ziyadeh N, Walker AM. Coronary heart disease outcomes in patients receiving antidiabetic agents. Pharmacoepidemiol Drug Saf. 2007 Jul. 16(7):711-25. [Medline]. Home PD, Pocock SJ, Beck-Nielsen H, Curtis PS, Gomis R, Hanefeld M, et al. Rosiglitazone evaluated for cardiovascular outcomes in oral agent combination therapy for type 2 diabetes (RECORD): a multicentre, randomised, open-label trial. Lancet. 2009 Jun 20. 373(9681):2125-35. [Medline]. Waknine Y. Diabetes rates rocket in US tweens and teens. Medscape Medical News. May 6, 2014. [Full Text]. Bennett WL, Maruthur NM, Singh S, Segal JB, Wilson LM, Chatterjee R, et al. Comparative effectiveness and safety of medications for type 2 diabetes: an update including new drugs and 2-drug combinations. Ann Intern Med. 2011 May 3. 154(9):602-13. [Medline]. Jaiswal M, Lauer A, Martin CL, Bell RA, Divers J, Dabelea D, et al. Peripheral Neuropathy in Adolescents and Young Adults With Type 1 and Type 2 Diabetes From the SEARCH for Diabetes in Youth Follow-up Cohort: A pilot study. Diabetes Care. 2013 Dec. 36(12):3903-8. [Medline]. [Full Text]. Tucker M. Peripheral Neuropathy Common in Youth With Type 2 Diabetes. Medscape Medical News. Available at http://www.medscape.com/viewarticle/815107. Accessed: December 3, 2013. The authors and editors of Medscape Reference gratefully acknowledge the contributions of previous author Jean-Claude DesMangles, MD,to the development and writing of the source article.